Philosophical Transactions of the Royal Society B 369:20130525 (2014). Many physica l and biological systems can be studied using complex network theory, a new statistical physics understanding of graph theory. 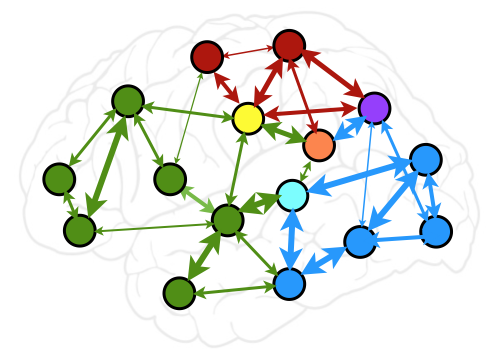 The recent application of complex network theory to the study of functional brain networks generated great enthusiasm as it allows addressing hitherto non-standard issues in the field, such as efficiency of brain functioning or vulnerability to damage. However, in spite of its high degree of generality, the theory was originally designed to describe systems profoundly different from the brain. We discuss some important caveats in the wholesale application of existing tools and concepts to a field they were not originally designed to describe. At the same time, we argue that complex network theory has not yet been taken full advantage of, as many of its important aspects are yet to make their appearance in the neuroscience literature. Finally, we propose that, rather than simply borrowing from an existing theory, functional neural networks can inspire a fundamental reformulation of complex network theory, to account for its exquisitely complex functioning mode.